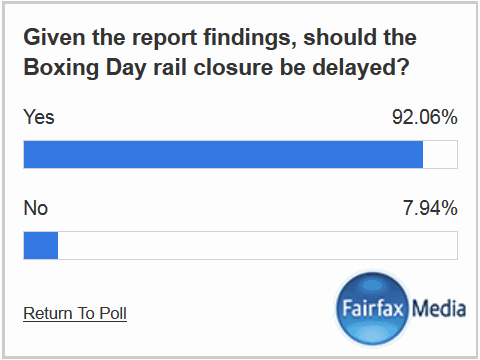 Future of Newcastle rail line still in doubt ← Save Our Rail NSW Inc. The state government may not have secured the support of two upper house MPs who will hold the balance of power in a crucial vote on the future of Newcastle’s heavy rail line, reports the Maitland Mercury. The vote had been expected to take place on Tuesday, but did not eventuate. “We think the Shooters and Fishers appear not to be locked into approving the bill,” Save Our Rail vice-president Kim Cross said. Save Our Rail also held a rally outside Parliament House in Sydney on Tuesday to protest against the rail cut. There have been moves in recent days to demonstrate to Mr Brown and Mr Borsak that the rail cut would significantly affect people in regional parts of the Hunter, including Maitland.